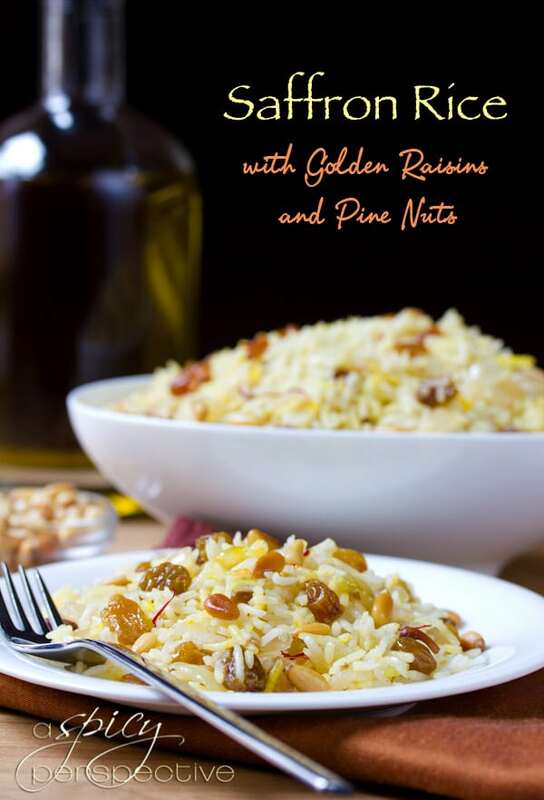 I’ve got a special treat for you today, a lovely Saffron Rice with Golden Raisins and Pine Nuts dish and a book release party! In the last couple years, I’ve made some great friends within the blogging community. Individuals who’s heart, talent and friendship is something to be sought after. I feel very fortunate. Today I’m celebrating with one of these friends, Faith Gorsky from An Edible Mosaic. 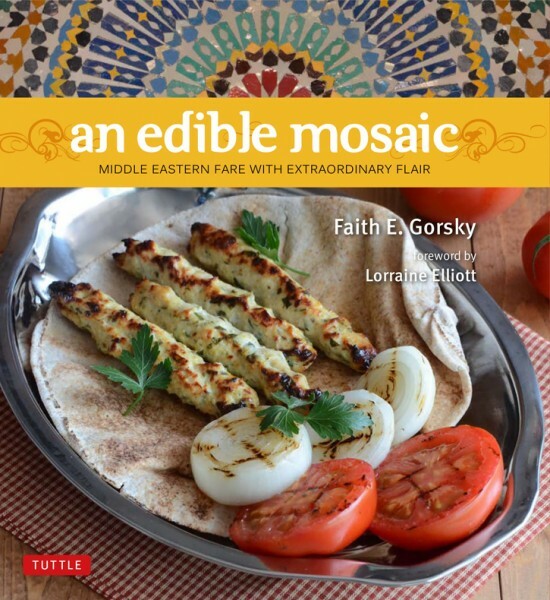 Faith has just released her first cookbook: An Edible Mosaic: Middle Eastern Fare with Extraordinary Flair. This post is part of a virtual book launch party honoring all the time and effort Faith put into this marvelous book. Whoot! An Edible Mosaic: Middle Eastern Fare with Extraordinary Flair has over 100 Middle Eastern recipes, with many dishes from the Levant, and other areas of the Middle East. As a newlywed, Faith spent six months living in the Middle East, where she fell in love with the culture and cuisine. After multiple return trips, Faith has become a “mother-in-law taught” expert on authentic regional Middle Eastern cuisine. She has brilliantly taken these traditional dishes and streamlined them for modern cooks. Faith’s book is available to order on Amazon and Barnes & Noble. You can also visit Faith’s blog to check out her Virtual Book Launch Party, see the other bloggers participating, and enter a giveaway with fabulous prizes! 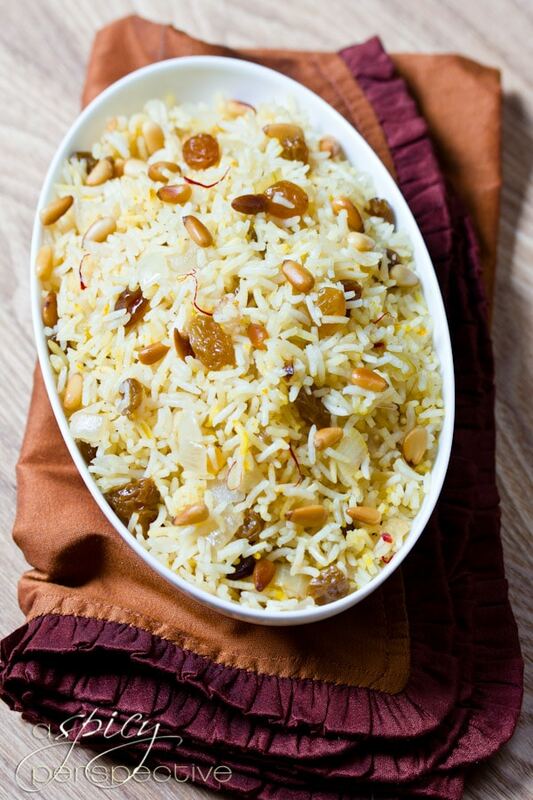 Saffron Rice with Golden Raisins and Pine Nuts would also make a wonderful Gluten Free side dish for Thanksgiving! “ROZ MLOW’WAN” Recipe courtesy of An Edible Mosaic: Middle Eastern Fare with Extraordinary Flair by Faith Gorsky (Tuttle Publishing; Nov. 2012); reprinted with permission. 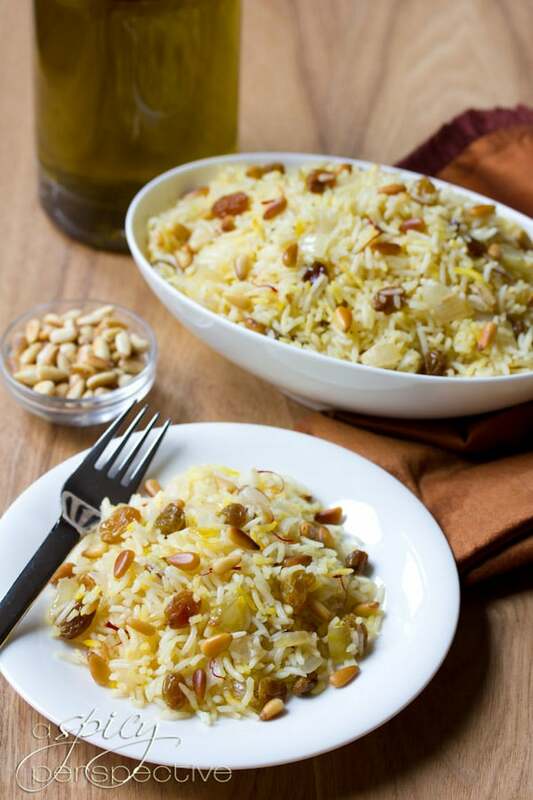 Legit speechless, that saffron rice with golden raisins and pine nuts recipe look unreal! Definitely, I will make it on the weekend for my family. I made this a couple of years ago and it was a huge hit with my family. Delicious! Have made it several times since. On the menu tonite and making my mouth water! I have added coconut oil and ghee instead of olive oil and 4-5 cloves and 1 anise to make this recipe rich. I have also made your 15 Bean Salad to side this recipe. My next trial will be your Roasted Red Pepper Pesto Pasta. Looks amazing! 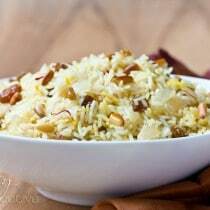 Growing up, my best friend’s family was from Iran, and her mom would always make us saffron rice with pine nuts and raisins, and it was always my favorite. I would eat so much of it! Sooo delicious. Can’t wait to try this recipe. Gorgeous dish, Sommer. Mmmmm…I love golden raisins and pine nuts! I saw this pic on your FB page and had to check it out! I have a jar of saffron just begging to be used. I love the option of all the added spices, too. I gotta get this cookbook! I love love this, Sommer! Looks so good and the cookbook looks awesome! I have been eyeing this cookbook and what gorgeous photos Sommer! Great to see Faith have such support. You did justice to the recipe. Looks good. Your rice looks beautiful, I need to try it! I love seeing all of these amazing recipes :) Looks so comforting!! Amazing! I love those bright little raisins scattered through out! this looks amazing! I love this flavor combination! What a great book! 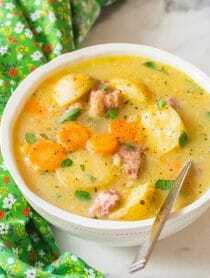 I have seen several recipes from other sites using Faith’s cookbook! I have to check it out on Amazon!! The rice dish looks amazing!! Loving everyone’s versions of this most favorite dish! This is gorgeous rice. I can practically taste the saffron right now. Soooo good! Beautiful photos as always!!! I’ve always loved Faith’s blog.. I know her book will be just as amazing. Isn’t the launch fun?? I’m really enjoying seeing everyone’s versions of Faith’s dish. Love your photos. The golden hue of that staffron rice really is lovely! The book cover is exquisite. Congratulations Faith! I love MiddleEastern cuisine. It is so healthy, tasty and diversified that we should incorporate more of these dishes into our home menus! Thank you Faith and thank you Sommer. Great looking recipe. I love middle eastern dishes, especially the spices. Faith’s recipe rocks! It is such a pleasure to support her. Your photos are gorgeous Sommer! That rice looks amazing. I’m a sucker for saffron. I love Middle Eastern food, but I’ve always been a little too intimidated to cook it. I definitely want to pick up this book–the rice looks fantastic! I can’t wait to get my hands on a copy of this cookbook. Middle Eastern is probably my favorite ethnic cuisine and everything I’ve heard about her new books sounds wonderful! Yuuuuum! I loved it too! And now I miss it. I had bought “An Edible Mosaic Cookbook” and I love it. This Rice Dish will be served at my Thanksgiving dinner. Thank you so much for posting. 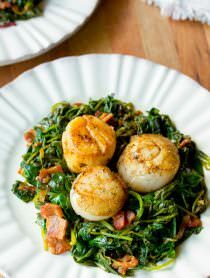 Just the kind of weeknight dish I love to make. Would probably serve it with stir-fried veggies and shrimp. Looks great Sommer! Gorgeous photos Sommer – love the saffron threads running through the rice. I love Faith’s new cookbook – I’ve made a bunch of recipes from it already and everything has come out so good! 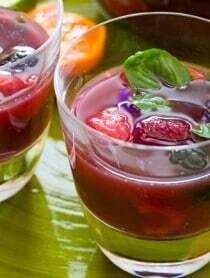 I can’t wait to try this recipe and many more from An Edible Mosaic. Hi! I am visiting from Faith’s site, and I just love the little “nibbles and bits” of your site that I have perused. Your photography is AH-MAZING! I had better subscribe so that I don’t miss out! Thanks Letty, I’m so glad you like ASP and am always happy to make new friend! This rice looks so fabulous! Love your photos. And I’m so excited for this cookbook! !